What is the User Tagging Page? 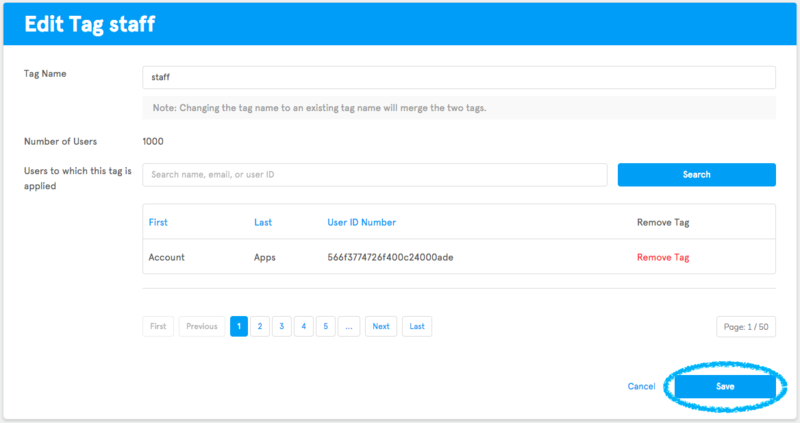 The User Tagging page lets you manage the User Tags that you have created for your app. The User Tagging page is used in conjunction with the User Management page. If you would like to learn more about the User Management page you can do so here. What are the different sections of the User Tagging Page, and how do you use them? User tags are used all throughout our system. They can be used in a variety of ways and can become an integral part of your app! You can use them to get behavioral data on your users, send out targeted push notifications, and allow you to add and restrict access to areas of your app. 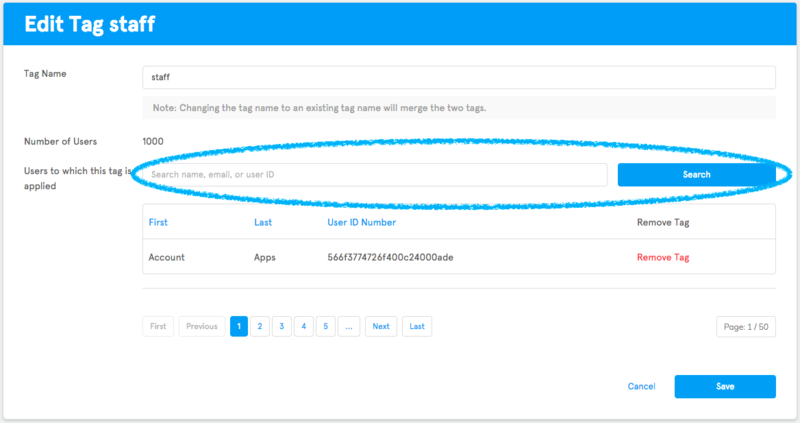 Let’s go over the sections of the User Tagging page so that you can begin managing your app’s user tags in no time! 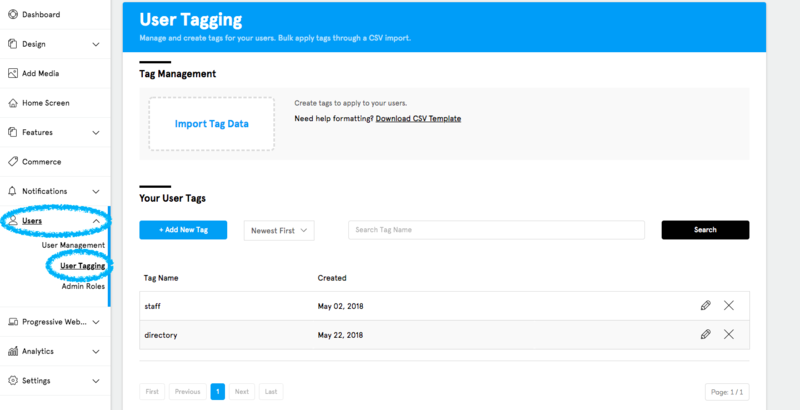 Before you begin to add user tags or assign tags to user’s pre-existing profiles in your app, first you’ll need to download the .CSV template that we have created. To do this click the “Download CSV Template” link. When filling out the .CSV template, make sure you don’t add or remove any of the columns in the template, otherwise the template won’t work. The only fields that are required are email and password, and you can leave the rest blank if you want to. Note: if you’re adding tags to user profiles, make sure they have been created in the User Management page first. If you need help with how to create user profiles, we have an article on that which you can find here. Once you’ve added the user profile information to the .CSV template all you need to do is click on the “Import Tag Data” button and locate the .CSV file on your computer. In the Your User Tags section you can view all of the user tags in your app. You can add new tags, search pre-existing tags, manage pre-existing tags, and remove tags that you don’t want to use any more. Let’s go over the different areas of the Your User Tags section. First you will see the Add New Tag button. You can click on this button to add a new tag to your app. When you click on this button you’ll be taken to a page where you can type in the new tag that you want to add to the app. To add a new tag, simply type the name of the tag that you want to use in the Tag Name section and click Save. Congratulations, you’ve just added a new tag to your app! You’re now able to apply it to your user’s in-app profiles and plugins! 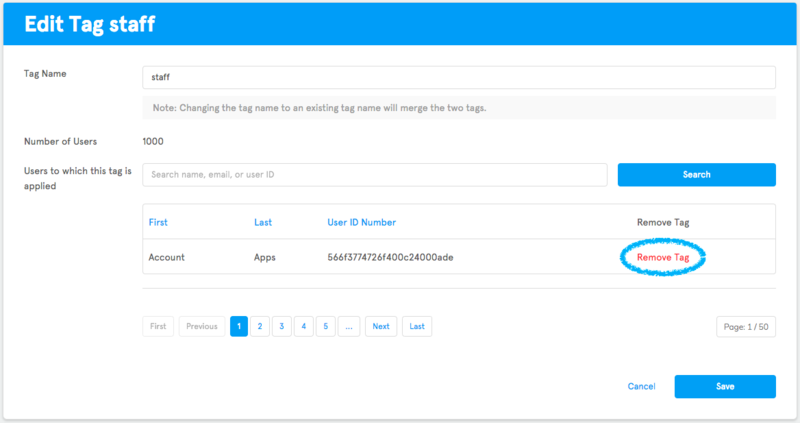 Your new tag will also display alongside all of your other app’s tags in the Your User Tags section. Once you have created a number of user tags, you can sort them by newest, oldest, titled A-Z, or titled Z-A, and can search for a specific tag in this section. If you would like to edit a tag click on the pencil icon next to the tag which will bring you to the Individual User Tag page. You are also able to delete a tag if you don’t want to use it in your app anymore. Now let’s go over the Individual User Tag page. 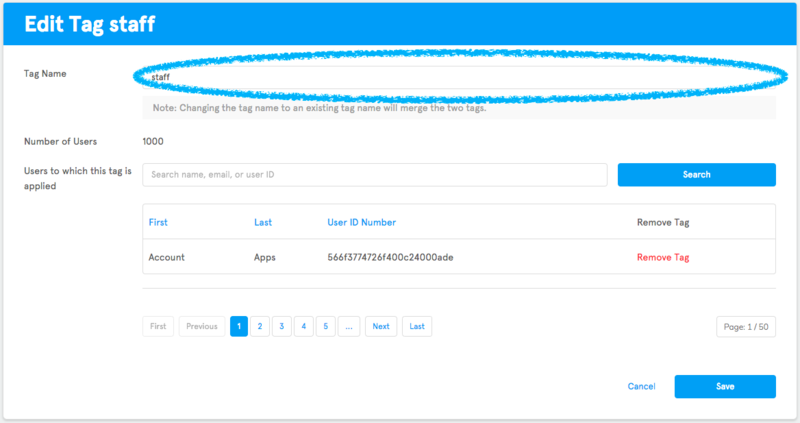 The Individual User Tag page is where you can change a user tag, as well as see which users have that tag assigned to them. If you would like to adjust a tag’s name simply go to the Tag Name section and type in the changes that you want to make to that tag’s name. Note: If you change the tag’s name to an existing tag name, those two tags will be merged together. You are also able to look at and search through all of the users that have that tag applied to their in-app profiles here. If you would like to remove the tag from a user, all you need to do is click “Remove Tag” next to that user’s User ID Number. Once you have completed all of the changes that you want to make to that tag, click “Save” at the bottom of the page. Using the Tagging Tab in the Feature Editor, you can set up tags that will automatically be applied to user’s profiles every time they access that plugin. This can help you see which areas of the app are most popular, and who is visiting those areas. You can view how often a tag has been applied to a user’s profile in the User Management page. With the Security Tab in the Feature Editor, you can set up tags that are required for a user to gain access to that plugin. You can use this to lock-down Admin or VIP-only sections of the app so that unauthorized users will be unable to see that content in the app. Note: We recommend that you use different tags for the Tagging and Security Tabs if you decide to use both at the same time in your app. You can use User Tags to create custom segments of users to send targeted push notifications to. Want to send a notification to all users with the tag of “VIP”? You can do that! If you would like to learn more about our push notifications and the custom segments you can create you can do so here.